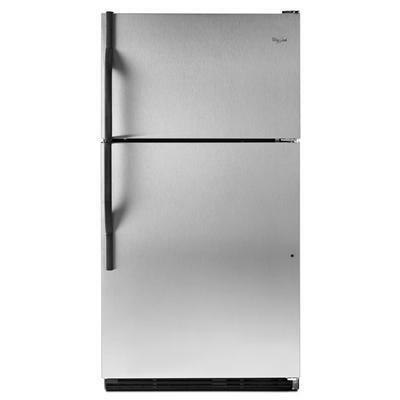 Keep your food fresh and refrigerator looking new with this 18 cu. 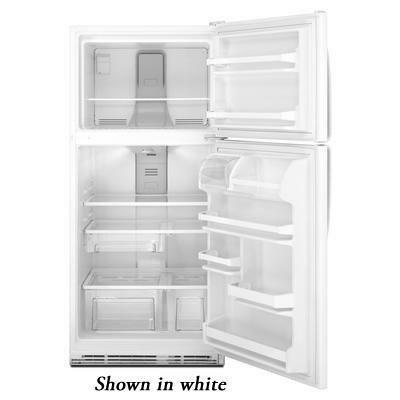 ft. ENERGY STAR® qualified top-freezer model. It features humidity-controlled crispers to help preserve the freshness of fruits and vegetables with selectable humidity levels. This model also features SpillMizer™ glass shelves traps leaks so cleaning up after spills is easy. Refrigerator 13.2 cu. ft. / 0.37 cu. m.
Technologies -SpillMizer™ glass shelves help to contain leaks and spills for easier cleanup, while the transparent design gives the refrigerator's interior a cleaner, brighter appearance. -Accu-Chill™ Temperature Management System measures the internal temperature and activates the compressor only when necessary to conserve energy. Additional Information -Up-Front Temperature Controls make temperature management easy by placing the interior controls at the front of the refrigerator. -Adaptive Defrost System monitors when the compressor is running and defrosts only when necessary, resulting in improved food preservation and energy savings. -2 Crispers. -4 Shelves. -ADA Compliant. -Optional ice maker. Additional Dimensions Depth Excluding Doors 28 1/2(72.39cm); Height To Top Of Cabinet 65 1/2(166.37); Depth Radius 59 1/4(150.49cm); Depth Closed Including Handles 32 3/4(83.18cm).